MedievalMorsels spent the morning yesterday, willow stick (wand if you will!) in hand, in splendid sunny weather marking the boundary stones which demarcate the Parish of St Michael’s at the North Gate - "Beating the Bounds" in other words. An age old parish practice, probably dating from Saxon times. In the days before maps and written title deeds a knowledge of the physical boundaries of property was very important, the parish was the basic unit of taxation and government. So the custom grew up of walking the boundaries, stopping at intervals to strike boundary stones to ‘mark' the bounds. Each Ascension Day groups from English parishes used to mark the boundary stones in chalk and strike them with willow wands. At St Michael’s at the North Gate, the City Church of Oxford, this activity has been recorded since 1428 but probably dates back to before the Norman conquest. Prayers were offered for the crops which sustained life but now, keeping the tradition alive in a modern city parish, prayers are offered for the shops, colleges and city workers, students and visitors. You see, the boundary stones or their known positions are to be found not in field or hedgerow but in shops, delivery yards, bicycle sheds, Oxford Colleges, on walls and in the street! Colleges or buildings of note wholly or partially within the parish boundary include St Peter’s College, Brasenose College, The Bodleian Library, Exeter College, Jesus College and Lincoln College. So we had a very illustrious morning indeed - honey coloured stonework, notable architecture under a clear blue sky. The boundary mark in Marks and Spencer's ladies department - a Father Ted moment perhaps? Brasenose College was kind enough to provide coffee and cake to a parched throng of willow wafters part-way through the morning. 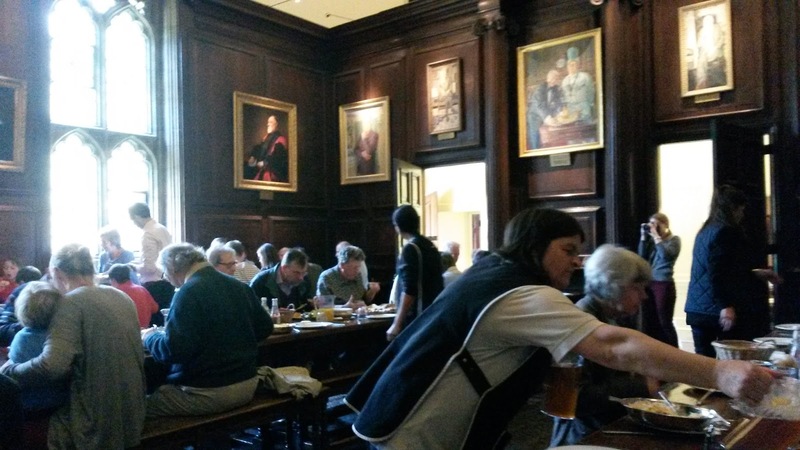 Lincoln College was hospitable enough to provide a traditional ploughman’s lunch and pints of ivy beer brewed by the Bursar a couple of days previously. To finish off, madrigals were sung from Lincoln College tower and hot pennies thrown for local children - previously waifs and strays of the parish perhaps - to collect form the lawn in the quad. Now about that ivy beer - at lunchtime on Ascension Day the connecting door between Brasenose and Lincoln Colleges is opened and members of Brasenose are entitled to be entertained to free beer by Lincoln. It became the custom for Lincoln to taint the beer with ground ivy to discourage the Brasenose students from taking too great an advantage of the hospitality. The beaters were able to take advantage of this enduring custom too….a very nice ale, very welcome and drinkable actually!